Sleep apnea is a common ailment with potentially serious complications—and many people don’t even know that they have it. Fortunately, the condition is easily treated and can be managed with a little bit of work. Keep reading to learn more about this health problem. An apnea is a pause in breathing, and sleep apnea is when you tend to stop breathing in your sleep anywhere from five to thirty times in an hour. These pauses can last anywhere from a few seconds to several minutes, and usually don’t even wake you up. In fact, most people who have trouble breathing in their sleep don’t even realize it. Although sleep apnea can happen to anybody, even children, those who are most at risk are male, overweight, over the age of 40, or have large tonsils. One of the biggest symptoms of having sleep apnea is excessive tiredness, even if you’re getting a full night of rest. This is an indication that even though you sleep a lot, you aren’t sleeping well—because you’re having trouble breathing when you do. Other symptoms of sleep apnea include snoring and a dry mouth. Usually, the first one to notice symptoms such as snoring or stopped breathing will be a spouse or sleeping partner. Unfortunately, doctors can’t detect the condition during routine visits, so it’s important to let your physician know if you snore extremely loudly or suffer from debilitating drowsiness. Sleep apnea can occur for one of two reasons. In central sleep apnea, the brain cannot communicate properly with the muscles that control breathing. The most common reason for sleep apnea, though, is obstruction in the throat, which is caused when the throat muscles relax so much that they can actually block the air passageway. Obstructive sleep apnea can be caused by obesity, enlarged tonsils, or even simply excess tissue in the throat. It’s very important to get help if you suspect that you suffer from sleep apnea. There are many different treatments for this condition, ranging from lifestyle changes to surgery. For mild cases, the problem can be alleviated simply by altering sleeping position—lying on your back tends to cause sleep apnea, while lying on your side reduces it. Some people find that sleeping on a slight slope or in a reclining position can also help. 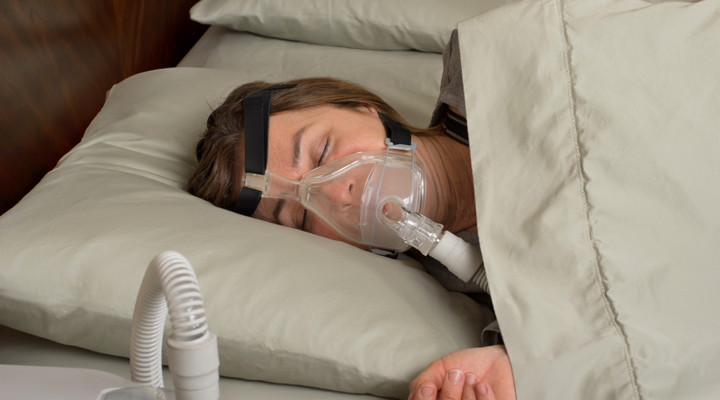 In more serious cases, some people might use a Continuous Positive Airway Pressure (CPAP) machine, which fits a mask over your mouth and nose to adjust the air pressure and keep your airways open. Sometimes mouth inserts are used to help keep the jaw open and air flowing. In severe cases, surgery to remove excess tissue might be the best solution. If you suffer from snoring and extreme tiredness, you might have sleep apnea. Talk with your doctor about it next time you visit and see what treatment they recommend for you.